A Dog's Way Home follows a young pup named Bella who is separated by her human family and then sets out on her own to reunite with her loved ones across two states, braving the wilderness, making friends, and facing danger and tragedy at almost every corner. Despite a predictable story, you can't help but fall in love with Bella from the start and follow her on her journey. The 1080p HD video and lossless DTS-HD MA 5.1 audio presentations are both good and the few bonus features are with your time. Recommended! Author William Bruce Cameron stamped his name on the four-legged friend genre by creating a series of books that focus mainly on dogs and their adventures with their human counterparts. A few years ago, Hollywood produced Cameron's A Dog's Purpose and now we have A Dog's Way Home, with Cameron also serving as a screenwriter. Add in notable filmmaker Charles Martin Smith, who is no stranger to animal films (Air Bud, Dolphin Tale I and II), and producer Gavin Polone (Gilmore Girls, Curb Your Enthusiasm, Zombieland), and you have yourself a "better-than-it-should-be" family film about dog who wants to be with its family. A Dog's Way Home is nothing new. In fact, you've probably seen the story before in films like Milo and Otis or Homeward Bound: The Incredible Journey, all of which deal with lost pets finding their way back to their human family. This one features the usual adventures, laughs, and suspense that comes with these types of films. That all being said, once you look at this film's dog-protagonist, Bella, you're going to be instantly hooked and follow, laugh, and cry with her on her journey. It might be her puppy dog eyes or the great voice work of Bryce Dallas Howard (she narrates Bella's inner monologue), but you quickly grow to love this dog and root for her along the way. The story begins in Denver, Colorado where a young couple adopts a young homeless pup and name it Bella. Bella instantly loves her new family, but there is a nasty businessman who is looking to tear down the building she had been sleeping in, and a villainous dog catcher who wants to lock up Bella, due to some Denver law that prohibits dogs like Bella within city limits. The young couple sends Bella a couple of states over to a temporary home as they arrange new housing where Bella can be safe with them outside city limits. However, Bella just wants to be with her new family and sets out by herself to be with them again in a 400-mile journey that takes a long time. It's not all fun and family adventures, though, as the writers and filmmakers have added some very adult themes that might upset some viewers. (Bella faces death by starvation, predators, and more.) This film may be cheesy and predictable at times, but it also knows how and when to perfectly tug at those heartstrings. Plus, Bella's charm and cuteness will overload your senses. The real-life dog is perfect in the film and I'm so glad they didn't go CGI with it, as it would have been silly to watch and brought us out of the film and not related this great character. A Dog's Way Home is a warm, family-friendly film that will have you loving on your four-legged family members. 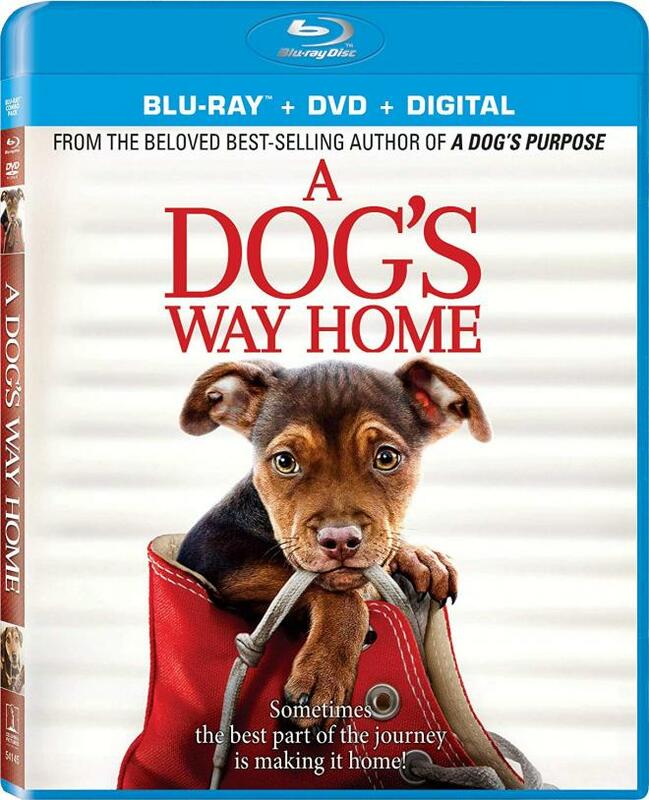 A Dog's Way Home comes with a 50GB Blu-ray Disc and a DVD copy from Sony Pictures. The discs are housed in a hard, blue plastic case with a cardboard sleeve. There is an insert for a digital download as well. A Dog's Way Home comes with a 1080p HD transfer and is presented in a 2.40:1 aspect ratio. This is great looking digitally shot film that reveals excellent detail and colors throughout various landscapes and locations. Colors are bold and rich in each setting, offering realistic green trees, yellow and brown fields, and some great blue skies. The white ice during the avalanche scene is also well balanced too. Bella's brown and black fur looks clean with varying shades of each color. Human clothes also bring out the primary colors quite well. Black levels are mostly deep and inky throughout, however, there can be some slight crush here and there during the lower lit scenes. Detail is sharp and vivid, with close-ups of Bella showing individual strands of fur and the bumps on her nose. You can even distinguish whiskers and eyelashes as well. Wider shots of pastures, trees, and city buildings have their fair share of fine detail too, from sharp rocks near rivers to layers of ice in the mountains, all of which look wonderful in this video presentation. Human skin tones are natural as well. There is some significant noise in darker scenes, but it never really took away from the viewing experience, leaving this with a good video score. A Dog's Way Home comes with a lossless DTS-HD MA 5.1 audio mix and is more front heavy with its soundscape than a fully immersive 5.1 mix. A lot of the film consists of people talking or Bella's narration as she wonders through the 400-mile journey. The surround speakers perk up when the score and music play as she travels along. But it isn't until the second half of the film where the full integration of all the sound effects come to fruition with city noises of cars and people walking, nature and other wildlife sounds, including birds, and other dogs. The avalanche sequence is the highlight, as you get the low end of bass that covers all speakers as the snow rushes past. Other than those sound effects, it's straight on narration or people talking for the most part, which is always clear and easy to follow along with, and free of any pops, cracks, hiss, and shrills. Almost 40 minutes of bonus features are included here that focus on Shelby the Dog's personal story and getting her ready for the big screen. Cast and crew interviews are present as well as 4 deleted scenes and a cute, short bit on how to make some dog treats at home for your four-legged loved one. Dog Days: Shelby's Production Diary (HD, 15 Mins.) - This shows how Shelby the dog was adopted, got the part in the film and played Bella. It also examines how she was trained and some of her scenes. An Unforgettable Journey (HD, 11 Mins.) - This is a decent sized EPK that has interviews with cast and crew, along with footage that focuses on the original novel, casting, Shelby the dog's personal journey and getting ready for the film, locations, tone, themes, and more. Deleted Scenes (HD, 4 Mins.) - There are four deleted scenes here, which are worth your time and included scenes with Bella and more. DIY Doggie Treats with Shelby (HD, 9 Mins.) - Shelby the dog and Rocky Kanaka makes dog treats that every dog will love. A Dog's Way Home is a heart-warming film that has some fun adventures and some quite tense and tragic scenes that might upset some viewers. In the end, though, you'll have fallen in love with Bella and all of the film's mistakes and flaws will vanish, where you'll just have a good time with the characters and the story itself, even if you've seen it a thousand times before. The video and audio aspects are good here and the bonus features are worth watching. Recommended!